Its barely daybreak as we step outside, and the station thermometer displays a chilly 12C or 54F. 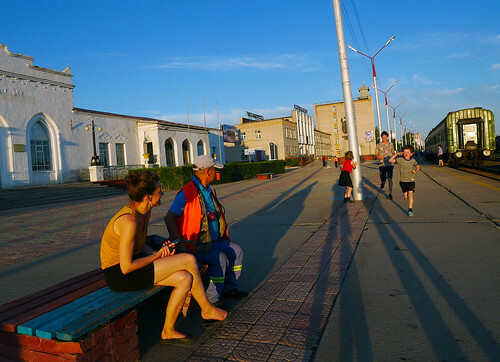 As the first rays of light peak out from behind, Ulan-Ude is slowly coming to life. We have a 45-minute halt here, where our locomotive is changed – electric giving way to diesel – and more than half of our original train formation is cut off. We will be seven carriages long upon departure, and ours will bring up the rear. In reality though, the Trans Mongolian route actually branches off at the next station, the lesser known Zaudinskiy. 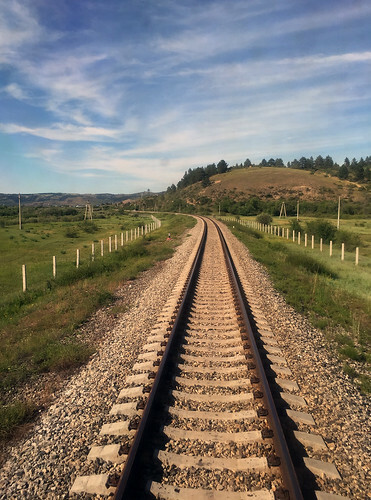 We halt there for precisely a minute, then depart on a separate alignment, crossing over the Trans Siberian mainline completely, before heading off in a southerly direction. 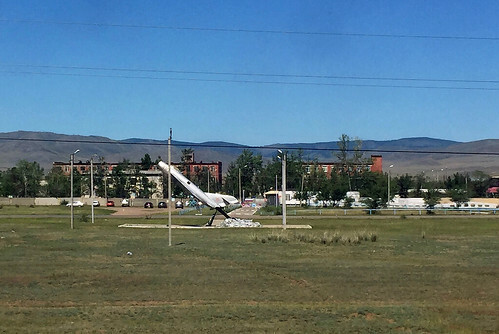 Ulan-Ude, the capital of Buryatia, and the third largest city in Eastern Siberia, extends far beyond anything we had imagined, and unlike Irkutsk, is fairly scruffy in appearance. But only a few miles past its outskirts, the topography is already starting to show change. 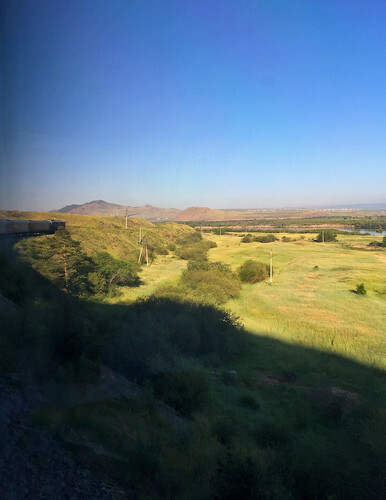 We ride a higher elevation for a while, the embankment well-supplied with sharp curves, revealing the front of our significantly shortened train, and some striking vistas around. Thirty minutes past our departure from Ulan-Ude, and every other occupant in our carriage is still fast asleep. A second snooze definitely seems in order. A stirring in the corridor awakens us some two hours later, just as we’re pulling into Zagustay, for an inexplicably long 18-minute halt. 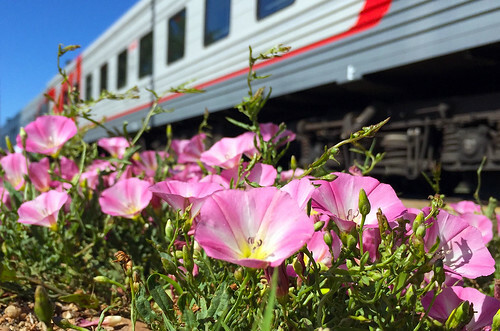 Its significantly warmer here than it was at Ulan-Ude this morning, and with wildflowers dotting the platform, more colorful too. Pulling out of Zagustay, we sight smokestacks to our east – the tell tale signs of a power plant. Its a big one too, and it lies on the banks of Lake Gusinoye, one of the largest in the area, who’s western edge we trace for several picturesque miles… The speed at which we’ve left taiga country behind is astonishing. 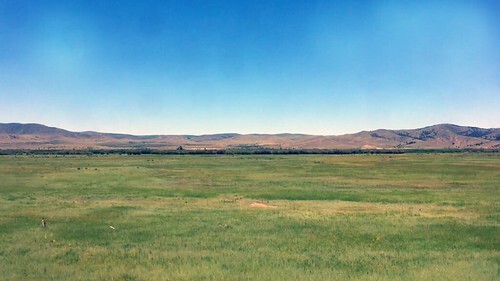 Where precisely that shift happened we’re not entirely sure, but south of Ulan-Ude, and all along our route today, the landscape resembles everything I would imagine Mongolia to be. Gently undulating hills, with only traces of vegetation; stunted trees, where they do exist, and expansive meadows. The Selenga is the main source of water in these parts, charting a course over 600-miles in length through Mongolia and Buryatia, eventually emptying into Lake Baikal. 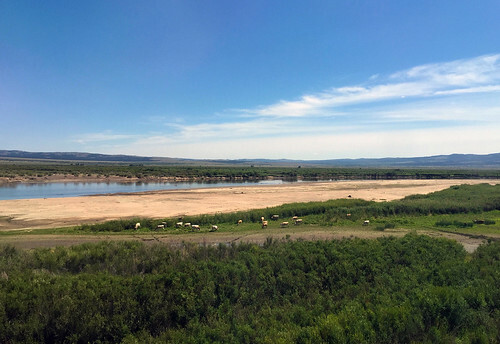 The Trans Mongolian Railway follows it for a considerable portion of its route, with the river getting a lot closer to the rail alignment south of Zagustay, where its fertile floodplain attracts bovine herds in search of pasture. Given the sheer absence of habitat in the area, we assume a lot many of them to be wild. While most just graze, a few choose the waterbody to cool off in, as the mercury continues to soar. 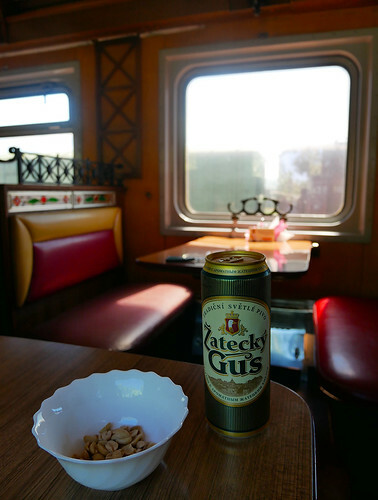 A restaurant car was never advertised on Train 362 to begin with, so seeing one at Irkutsk on the evening of our departure was a pleasant surprise. We head over there for one last piva on Russian soil, and of course, for some air-conditioning. It turns out to be a retro one too – probably amongst a handful that have survived a “modern” makeover. Dzhida is our last “long” stop prior to border control, and being one of the southernmost on the far flung Russian rail network, is rather rustic in its appearance. The 9-minute halt here is somewhat warranted though, since the little town is home to an air force base, and proudly displayed on its outskirts is an old fighter jet. Before we know it, Naushki is upon us. Having disregarded repeated warnings from the dining car matron, SK and I now make a beeline for our coach, clumsily maneuvering past dozens of passengers and their luggage, all waiting to alight from their respective carriages. We arrive at ours just as documents are being inspected, our Provodnitsa far from pleased. After the Naushki passengers have alighted and dispersed, and our passports have been thoroughly checked, we’re asked to disembark. Our carriage, it turns out, is the only one continuing on to Mongolia, and the 30-odd occupants from it will make up the “through” passengers for today. 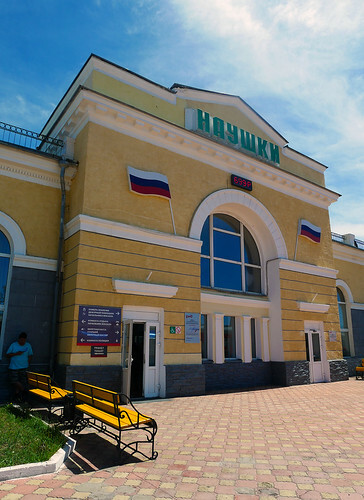 Russian flags adorn the station facade, and signboards posted at frequent intervals along the platform are laden with bureaucratese. 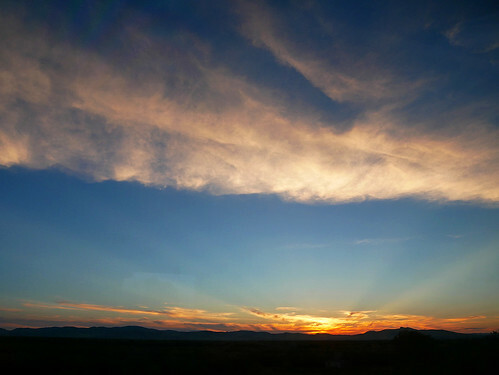 There’s no mistaking it – we’re at an international border station, and we have the better part of today to savor it. 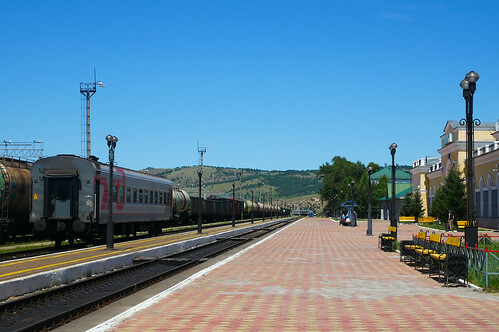 To form our opposite number, the northbound service to Ulan-Ude and Irkutsk, the train that we arrived on requires some amount of rearrangement. As the train moves off towards the yard, with our coach in tow, the distant track reveals a lone carriage. Its the through coach from Mongolia awaiting its fate. Its scheduled to leave Naushki in a couple of hours, with our reformatted train. We have over four to go… So how exactly does one keep busy for that duration of time in a sleepy little border town? In a variety of different ways, apparently. The youngest member of the Aussie tour group, for instance, was definitely not running to catch a train. He was simply running up and down the length of the platform to work up a sweat! The older Aussies, meanwhile, set off with their Russian guide, Ana, in search of a store to top up their supply of wine. A handful stayed behind, choosing to utilize the 200 RUB ($3) showers on site. The Swedish family used the empty platform to play with their kids, while the Dutch alternated between the air conditioned waiting room and the occasional platform stroll. The latter, despite the heat, to reassure their little boy that the train hadn’t disappeared entirely. The Mongolian girl, and what turned out to be her Korean employers, remained cocooned in the cooler confines of the station building. As for us, we watched with keen interest the goings-on at the station; the various locomotives passing by, the carriages being marshaled around, the important things. In between, we kept the local canines entertained. Closer to Train 361’s departure, we chat with a Russian military man about his coin collection, which sadly we fall short of contributing towards. He has more pressing duties though, and his entire unit to brief, prior to them boarding for Ulan-Ude. About an hour after the departure of Train 361, our carriage is placed back on the platform. A board set up alongside it proclaims “Custom Control Zone”. At 4:05 pm local time, as we’re ordered back on board, a Russian border patrol officer makes his way towards our carriage with a K-9 in tow. A thorough baggage sweep is followed by the stamping of our passports, and so far everything’s going smoothly. Till the customs officer chances upon the luggage of the Korean couple i.e. Whatever objectionable item they were attempting to carry out of Russia is eventually confiscated, but not without a significant amount of paperwork, and the payment of a fine, both of them borne by their hapless Mongolian aide. 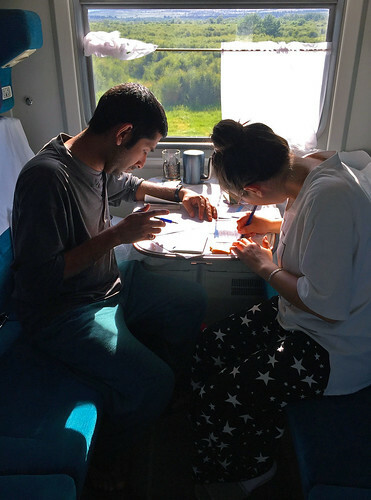 On the dot of 5:05 pm, as our international “train” pulls out of Naushki, the Provodnitsa comes through the corridor with practiced precision, handing out customs forms to each cabin, and informing us that we have about 20-minutes within which to use the toilets, before they’re locked again. The queues form almost immediately, passports are brought out once again, and paperwork is hurriedly filled. Outside, barbed wire fencing and lookout towers are all signs of an international border fast approaching. 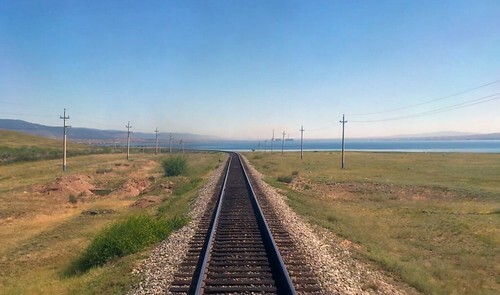 A few miles south of Naushki, a monument-like marker announces the end of the East Siberian Railway, an administrative division of the Russian Railways headquartered in Irkutsk. A little distance further, with the track fenced off on both sides, we ride through no man’s land. SK and I down a quick lunch of instant noodles, and a piva for good measure, while we’re still in neutral territory… And moments later, we’re in Mongolia! The border post here, as with the rest of the security infrastructure, a lot more humble looking than its counterpart to the north. There’s a little crossing station soon after, where a smartly turned out, red cap-donning guard, flags our train through. 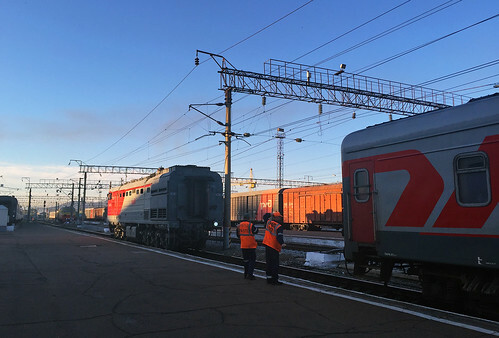 On the only other track, a northbound freight, with four Mongolian Railway locomotives, sets off towards Russia. 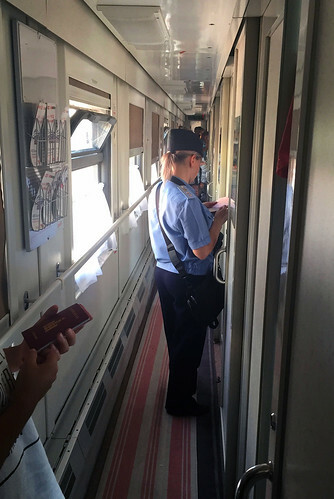 Arrival into Sükhbaatar is a couple of minutes early, with Mongolian border police and customs already waiting for us, and one of them saluting our train as it pulls in. Our passports and visas are checked onboard, and subsequently taken away to the customs building. With our carriage having sat in the sun for most of the day, it is by now oppressively hot inside, and waiting for our passports to be returned before we’re let out, promises to be a long, stifling and sweaty affair. Placed quite uncharitably on a siding rather than on the main platform, we’re finally allowed onto Mongolian soil after over an hour of waiting inside. Money changers swarm the carriage door as we try and exit but they’re only a minor annoyance in comparison. Outside, the air is cool, the sky is a gorgeous blue, and the light is slowly beginning to change. In Mongolian, Sükhbaatar means “strong hero”, and while the name is typically associated with revolutionary hero Damdin Sükhbaatar, its use is commonplace across Mongolia. By the country’s standards, Sükhbaatar, with only 20,000 people to its credit, is still considered a mid-size city, and being the capital of the province of Selenge, is a fairly important one too. But there’s not a whole lot to do there, and we still have a couple of hours to kill prior to departure. After studying the station and its buildings in tedious detail, and checking out the local park that lies adjacent to it, we return to the platform in anticipation of Train 271’s arrival. There’s some leftover Uzbek cherries to snack on, which we share with the only other occupant of the platform, Ana. She’s been busy with tour paperwork, and keeping an eye on our empty carriage, while her Aussie contingent takes a stroll around town. 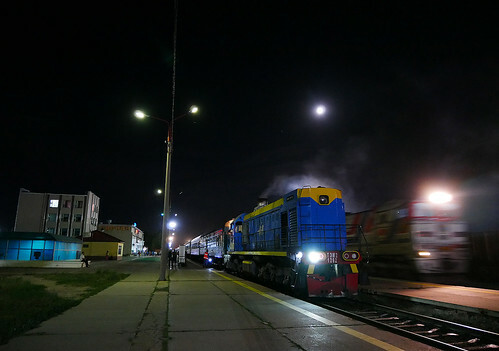 Train 271 is the daily service from Ulaanbaatar, and once it pulls in, an elaborate shunting procedure ensues, providing much needed excitement for the rest of our evening. After a fairly short layover here, it will return to the country’s capital as Train 263, with our international carriage ensconced within in its formation. As the light begins to fade, casting long shadows and warm hues, there’s finally some activity on the platform. Locals cluster around their respective carriages, waiting to board. The Provodnitsas take their positions. On our end, the Swedes are the first to return, then some of the Aussies, and then the rest of our fellow passengers, trickling in one by one, as we get closer to departure time… As the day draws to a close, the last of our pivas are brought out, and the samovar dispenses the hot water we need for our dinner of instant goodness. Magic hour at Sükhbaatar had already set the tone for what lay ahead, and less than an hour after our departure, we witness a spectacular sundown over a characteristic Mongolian horizon. Our last visual at twilight – wild horses grazing on the steppe. Close to 11 pm local time, we pull into Darkhan, the country’s second largest city. Its going to be an hour and twenty minutes here, necessitated by, believe it or not, even more train marshaling! 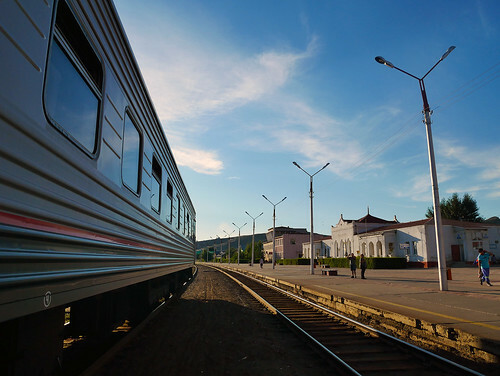 This time, our train will be merged with another that has just pulled in from Erdenet, Mongolia’s third largest city, and is also headed to the capital. 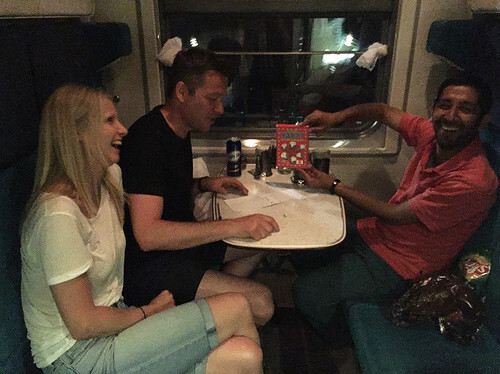 Tina and Rony, the Norwegian couple traveling with us, get into a heated argument with Ana at Darkhan, over each’s definition of democracy. Even SK has a hard time cooling things down, and its just as well our trains departure is called. Ana joins her tour group for cards and bevvies, while we end up with the Norwegians. Not to take any sides, but we’re eager to finish our bottle of Vodka, and learn a game of Russian dice, both of which they’ve graciously offered to help with. It promises to be a fun evening, with very little sleep in the offing, on this, the last of many nights on a train for us… Next on the Magistrale Diaries: The land of the Khaans. A full set of pics from Day 8 of our trip can be seen here.